The Mitsubishi Outlander P-HEV is the world's all-time best selling plug-in hybrid. Cumulative global sales reached 200,000 units in April 2019. A plug-in hybrid electric vehicle (PHEV) is a hybrid electric vehicle whose battery can be recharged by plugging it into an external source of electric power, as well by its on-board engine and generator. Most PHEVs are passenger cars, but there are also PHEV versions of commercial vehicles and vans, utility trucks, buses, trains, motorcycles, scooters, and military vehicles. Similarly to all-electric vehicles, plug-in hybrids displace emissions from the car tailpipe to the generators powering the electricity grid. These generators may be renewable, or may have lower emission than an internal combustion engine. Charging the battery from the grid can cost less than using the on-board engine, helping to reduce operating cost. Mass-produced plug-in hybrids were available to the public in China and the United States in 2010. By the end of 2017, there were over 40 models of series-production highway legal plug-in hybrids for retail sales. Plug-in hybrid cars are available mainly in the United States, Canada, Western Europe, Japan, and China. The top-selling models are the Mitsubishi Outlander P-HEV, the Chevrolet Volt family, and the Toyota Prius PHV. As of December 2018[update], the global stock of plug-in hybrid cars totaled 1.8 million units, out of 5.1 million plug-in electric passenger cars on the world roads at the end of 2018. As of December 2017[update], the United States ranked as the world's largest plug-in hybrid car market with a stock of 360,510 units, followed by China with 276,580 vehicles, and Japan with 100,860 units. A plug-in hybrid's all-electric range is designated by PHEV-[miles] or PHEV[kilometers]km in which the number represents the distance the vehicle can travel on battery power alone. For example, a PHEV-20 can travel twenty miles (32 km) without using its combustion engine, so it may also be designated as a PHEV32km. For these cars to be battery operated, they go through charging processes that use different currents. These currents are known as Alternating Current (AC) used for on board chargers and Direct Current (DC) used for external charging. Other popular terms sometimes used for plug-in hybrids are "grid-connected hybrids", "Gas-Optional Hybrid Electric Vehicle" (GO-HEV) or simply "gas-optional hybrids". GM calls its Chevrolet Volt series plug-in hybrid an "Extended-Range Electric Vehicle". The Lohner-Porsche Mixte Hybrid, produced as early as 1899, was the first hybrid electric car. Early hybrids could be charged from an external source before operation. However, the term "plug-in hybrid" has come to mean a hybrid vehicle that can be charged from a standard electrical wall socket. The term "plug-in hybrid electric vehicle" was coined by UC Davis Professor Andrew Frank, who has been called the "father of the modern plug-in hybrid". The July 1969 issue of Popular Science featured an article on the General Motors XP-883 plug-in hybrid. The concept commuter vehicle housed six 12-volt lead–acid batteries in the trunk area and a transverse-mounted DC electric motor turning a front-wheel drive. The car could be plugged into a standard North American 120 volt AC outlet for recharging. Lithium-ion battery pack, with cover removed, in a CalCars "PRIUS+" plug-in hybrid converted Toyota Prius converted by EnergyCS. In 2003, Renault began selling the Elect'road, a plug-in series hybrid version of their popular Kangoo, in Europe. In addition to its engine, it could be plugged into a standard outlet and recharged to 95% range in about 4 hours. After selling about 500 vehicles, primarily in France, Norway and the UK, at a price of about €25,000, the Elect'road was redesigned in 2007. With the availability of hybrid vehicles and the rising gas prices in the United States starting around 2004, interest in plug-in hybrids increased. Some plug-in hybrids were conversions of existing hybrids; for example, the 2004 CalCars converision of a Prius to add lead acid batteries and a range of up to 15 km (9 mi) using only electric power. In 2006, both Toyota and General Motors announced plans for plug-in hybrids. GM's Saturn Vue project was cancelled, but the Toyota plug-in was certified for road use in Japan in 2007. On September 5, 2007 Quantum Technologies and Fisker Coachbuild, LLC announced the launch of a joint venture in Fisker Automotive. Fisker intended to build a US$80,000 luxury PHEV-50, the Fisker Karma, initially scheduled for late 2009. In 2007, Aptera Motors announced their Typ-1 two-seater. However, the company folded in December 2011. In 2007, Chinese car manufacturer BYD Auto, owned by China's largest mobile phone battery maker, announced it would be introducing a production PHEV-60 sedan in China in the second half of 2008. BYD exhibited it January 2008 at the North American International Auto Show in Detroit. Based on BYD's midsize F6 sedan, it uses lithium iron phosphate (LiFeP04)-based batteries instead of lithium-ion, and can be recharged to 70% of capacity in just 10 minutes. In 2007 Ford delivered the first Ford Escape Plug-in Hybrid of a fleet of 20 demonstration PHEVs to Southern California Edison. As part of this demonstration program Ford also developed the first flexible-fuel plug-in hybrid SUV, which was delivered in June 2008. This demonstration fleet of plug-ins has been in field testing with utility company fleets in the U.S. and Canada, and during the first two years since the program began, the fleet has logged more than 75,000 miles. In August 2009 Ford delivered the first Escape Plug-in equipped with intelligent vehicle-to-grid (V2G) communications and control system technology, and Ford plans to equip all 21 plug-in hybrid Escapes with the vehicle-to-grid communications technology. Sales of the Escape PHEV were scheduled for 2012. On January 14, 2008, Toyota announced they would start sales of lithium-ion battery PHEVs by 2010, but later in the year Toyota indicated they would be offered to commercial fleets in 2009. On March 27, the California Air Resources Board (CARB) modified their regulations, requiring automobile manufacturers to produce 58,000 plug-in hybrids during 2012 through 2014. This requirement is an asked-for alternative to an earlier mandate to produce 25,000 pure zero-emissions vehicles, reducing that requirement to 5,000. On June 26, Volkswagen announced that they would be introducing production plug-ins based on the Golf compact. Volkswagen uses the term 'TwinDrive' to denote a PHEV. In September, Mazda was reported to be planning PHEVs. On September 23, Chrysler announced that they had prototyped a plug-in Jeep Wrangler and a Chrysler Town and Country mini-van, both PHEV-40s with series powertrains, and an all-electric Dodge sports car, and said that one of the three vehicles would go into production. On October 3, the U.S. enacted the Energy Improvement and Extension Act of 2008. The legislation provided tax credits for the purchase of plug-in electric vehicles of battery capacity over 4 kilowatt-hours. The federal tax credits were extended and modified by the American Clean Energy and Security Act of 2009, but now the battery capacity must be over 5 kWh and the credit phases out after the automaker has sold at least 200,000 vehicles in the U.S. Launched in China in December 2008, the BYD F3DM became the world's first mass-produced plug-in hybrid automobile. The BYD Qin, released in China in December 2013, replaced the F3DM. On December 15, 2008 BYD Auto began selling its F3DM in China, becoming the first production plug-in hybrid sold in the world, though initially was available only for corporate and government customers. Sales to the general public began in Shenzhen in March 2010, but because the F3DM nearly doubles the price of cars that run on conventional fuel, BYD expects subsidies from the local government to make the plug-in affordable to personal buyers. Toyota tested 600 pre-production Prius Plug-ins in Europe and North America in 2009 and 2010. Volvo Cars built two demonstration versions of Volvo V70 Plug-in Hybrids in 2009 but did not proceed with production. The V60 plug-in hybrid was released in 2011 and was available for sale. In October 2010 Lotus Engineering unveiled the Lotus CityCar, a plug-in series hybrid concept car designed for flex-fuel operation on ethanol, or methanol as well as regular gasoline. The lithium battery pack provides an all-electric range of 60 kilometres (37 mi), and the 1.2-liter flex-fuel engine kicks in to allow to extend the range to more than 500 kilometres (310 mi). GM officially launched the Chevrolet Volt in the U.S. on November 30, 2010, and retail deliveries began in December 2010. Its sibling the Opel/Vauxhall Ampera was launched in Europe between late 2011 and early 2012. The first deliveries of the Fisker Karma took place in July 2011, and deliveries to retail customers began in November 2011. The Toyota Prius Plug-in Hybrid was released in Japan in January 2012, followed by the United States in February 2012. Deliveries of the Prius PHV in Europe began in late June 2012. The Ford C-Max Energi was released in the U.S. in October 2012, the Volvo V60 Plug-in Hybrid in Sweden by late 2012. The Honda Accord Plug-in Hybrid was released in selected U.S. markets in January 2013, and the Mitsubishi Outlander P-HEV in Japan in January 2013, becoming the first SUV plug-in hybrid in the market. Deliveries of the Ford Fusion Energi began in February 2013. BYD Auto stopped production of its BYD F3DM due to low sales, and its successor, the BYD Qin, began sales in Costa Rica in November 2013, with sales in other countries in Latin America scheduled to begin in 2014. Qin deliveries began in China in mid December 2013. Deliveries to retail customers of the limited edition McLaren P1 supercar began in the UK in October 2013, and the Porsche Panamera S E-Hybrid began deliveries in the U.S. in November 2013. The first retail deliveries of the Cadillac ELR took place in the U.S. in December 2013. The BMW i8 and the limited edition Volkswagen XL1 were released to retail customers in Germany in June 2014. The Porsche 918 Spyder was also released in Europe and the U.S. in 2014. The first units of the Audi A3 Sportback e-tron and Volkswagen Golf GTE were registered in Germany in August 2014. 2 emissions below 100g/km. At the time of the announcement the carmaker was already testing a BMW 3 Series plug-in hybrid prototype. The first model available for retail sales will be the 2016 BMW X5 eDrive, with the production version unveiled at the 2015 Shanghai Motor Show. The second generation Chevrolet Volt was unveiled at the January 2015 North American International Auto Show, and retail deliveries began in the U.S. and Canada in October 2015. 2 targets. The Audi Q7 e-tron will follow the A3 e-tron already in the market. Also in March 2015, Mercedes-Benz announced that the company's main emphasis regarding alternative drives in the next years will be on plug-in hybrids. The carmaker plans to introduce 10 new plug-in hybrid models by 2017, and its next release was the Mercedes-Benz C 350 e, Mercedes’ second plug-in hybrid after the S 500 Plug-In Hybrid. Other plug-in hybrid released in 2015 are the BYD Tang, Volkswagen Passat GTE, Volvo XC90 T8, and the Hyundai Sonata PHEV. Global combined Volt/Ampera family sales passed the 100,000 unit milestone in October 2015. By the end of 2015, over 517,000 highway legal plug-in hybrid electric cars have been sold worldwide since December 2008 out of total global sales of more than 1.25 million light-duty plug-in electric cars. The BMW i8 was released in Europe in June 2014. In February 2016, BMW announced the introduction of the "iPerformance" model designation, which will be given to all BMW plug-in hybrid vehicles from July 2016. The aim is to provide a visible indicator of the transfer of technology from BMW i to the BMW core brand. The new designation will be used first on the plug-in hybrid variants of the new BMW 7 Series, the BMW 740e iPerformance, and the 3 Series, the BMW 330e iPerformance. Hyundai Motor Company made the official debut of its three model Hyundai Ioniq line-up at the 2016 Geneva Motor Show. The Ioniq family of electric drive vehicles includes the Ioniq Plug-in, which is expected to achieve a fuel economy of 125 mpg‑e (28 kW⋅h/100 mi; 17.1 kW⋅h/100 km) in all-electric mode. The Ioniq Plug-in is scheduled to be released in the U.S. in the fourth quarter of 2017. The second generation Prius plug-in hybrid, called Prius Prime in the U.S. and Prius PHV in Japan, was unveiled at the 2016 New York International Auto Show. Retail deliveries of the Prius Prime began in the U.S. in November 2016, and is scheduled to be released Japan by the end of 2016. The Prime has an EPA-rated all-electric range of 25 mi (40 km), over twice the range of the first generation model, and an EPA rated fuel economy of 133 mpg‑e (25.9 kW⋅h/100 mi) in all-electric mode (EV mode), the highest MPGe rating in EV mode of any vehicle rated by EPA. Unlike its predecessor, the Prime runs entirely on electricity in EV mode. Global sales of the Mitsubishi Outlander P-HEV passed the 100,000 unit milestone in March 2016. BYD Qin sales in China reached the 50,000 unit milestone in April 2016, becoming the fourth plug-in hybrid to pass that mark. In June 2016, Nissan announced it will introduce a compact range extender car in Japan before March 2017. The series plug-in hybrid will use a new hybrid system, dubbed e-Power, which debuted with the Nissan Gripz concept crossover showcased at the 2015 Frankfurt Auto Show. In December 2017, Honda began retail deliveries of the Honda Clarity Plug-In Hybrid in the United States and Canada, with an EPA rated electric-only range of 76 km (47 miles). The Toyota Prius Plug-in Hybrid is a series-parallel hybrid. PHEVs are based on the same three basic powertrain architectures of conventional hybrids; a series hybrid is propelled by electric motors only, a parallel hybrid is propelled both by its engine and by electric motors operating concurrently, and a series-parallel hybrid operates in either mode. While a plain hybrid vehicle charges its battery from its engine only, a plug-in hybrid can obtain a significant amount of the energy required to recharge its battery from external sources. The battery charger can be on-board or external to the vehicle. The process for an on-board charger is best explained as AC power being converted into DC power, resulting in the battery being charged. On-board chargers are limited in capacity by their weight and size, and by the limited capacity of general-purpose AC outlets. Dedicated off-board chargers can be as large and powerful as the user can afford, but require returning to the charger; high-speed chargers may be shared by multiple vehicles. Using the electric motor's inverter allows the motor windings to act as the transformer coils, and the existing high-power inverter as the AC-to-DC charger. As these components are already required on the car, and are designed to handle any practical power capability, they can be used to create a very powerful form of on-board charger with no significant additional weight or size. AC Propulsion uses this charging method, referred to as "reductive charging". Charge-depleting mode allows a fully charged PHEV to operate exclusively (or depending on the vehicle, almost exclusively, except during hard acceleration) on electric power until its battery state of charge is depleted to a predetermined level, at which time the vehicle's internal combustion engine or fuel cell will be engaged. This period is the vehicle's all-electric range. This is the only mode that a battery electric vehicle can operate in, hence their limited range. Mixed mode describes a trip using a combination of multiple modes. For example, a car may begin a trip in low speed charge-depleting mode, then enter onto a freeway and operate in blended mode. The driver might exit the freeway and drive without the internal combustion engine until all-electric range is exhausted. The vehicle can revert to a charge sustaining-mode until the final destination is reached. This contrasts with a charge-depleting trip which would be driven within the limits of a PHEV's all-electric range. The optimum battery size varies depending on whether the aim is to reduce fuel consumption, running costs, or emissions, but a recent study concluded that "The best choice of PHEV battery capacity depends critically on the distance that the vehicle will be driven between charges. Our results suggest that for urban driving conditions and frequent charges every 10 miles or less, a low-capacity PHEV sized with an AER (all electric range) of about 7 miles would be a robust choice for minimizing gasoline consumption, cost, and greenhouse gas emissions. For less frequent charging, every 20–100 miles, PHEVs release fewer GHGs, but HEVs are more cost effective. " PHEVs typically require deeper battery charging and discharging cycles than conventional hybrids. Because the number of full cycles influences battery life, this may be less than in traditional HEVs which do not deplete their batteries as fully. However, some authors argue that PHEVs will soon become standard in the automobile industry. Design issues and trade-offs against battery life, capacity, heat dissipation, weight, costs, and safety need to be solved. Advanced battery technology is under development, promising greater energy densities by both mass and volume, and battery life expectancy is expected to increase. The cathodes of some early 2007 lithium-ion batteries are made from lithium-cobalt metal oxide. This material is expensive, and cells made with it can release oxygen if overcharged. If the cobalt is replaced with iron phosphates, the cells will not burn or release oxygen under any charge. At early 2007 gasoline and electricity prices, the a break-even point is reached after six to ten years of operation. The payback period may be longer for plug-in hybrids, because of their larger, more expensive batteries. Nickel–metal hydride and lithium-ion batteries can be recycled; Toyota, for example, has a recycling program in place under which dealers are paid a US$200 credit for each battery returned. However, plug-in hybrids typically use larger battery packs than comparable conventional hybrids, and thus require more resources. Pacific Gas and Electric Company (PG&E) has suggested that utilities could purchase used batteries for backup and load leveling purposes. They state that while these used batteries may be no longer usable in vehicles, their residual capacity still has significant value. More recently, General Motors (GM) has said it has been "approached by utilities interested in using recycled Volt batteries as a power storage system, a secondary market that could bring down the cost of the Volt and other plug-in vehicles for consumers". Ultracapacitors (or "supercapacitors") are used in some plug-in hybrids, such as AFS Trinity's concept prototype, to store rapidly available energy with their high power density, in order to keep batteries within safe resistive heating limits and extend battery life. The CSIRO's UltraBattery combines a supercapacitor and a lead acid battery in a single unit, creating a hybrid car battery that lasts longer, costs less and is more powerful than current technologies used in plug-in hybrid electric vehicles (PHEVs). Aftermarket conversion of an existing production hybrid to a plug-in hybrid ) typically involves increasing the capacity of the vehicle's battery pack and adding an on-board AC-to-DC charger. Ideally, the vehicle's powertrain software would be reprogrammed to make full use of the battery pack's additional energy storage capacity and power output. Many early plug-in hybrid electric vehicle conversions have been based on the Toyota Prius. Some of the systems have involved replacement of the vehicle's original NiMH battery pack and its electronic control unit. Others add an additional battery back onto the original battery pack. In recent years, demand for all- electric vehicles, especially in the United States market, has been driven by government incentives through subsidies, lobbyists, and taxes. In particular, American sales of the Nissan Leaf have depended on generous incentives and special treatment in the state of Georgia, the top selling Leaf market. According to international market research, 60% of respondents believe a battery driving range of less than 160 km (99 mi) is unacceptable even though only 2% drive more than that distance per day. Among popular current all-electric vehicles, only the Tesla (with the most expensive version of the Model S offering a 265 miles (426 km) range in the U.S. Environmental Protection Agency 5-cycle test) significantly exceeds this threshold. The Nissan Leaf has an EPA rated range of 75 miles (121 km) for the 2013 model year. 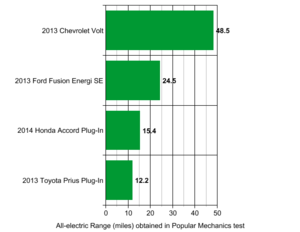 All-electric range, in miles, for several popular model year 2013 plug-in hybrids, as observed in testing by Popular Mechanics magazine. Providing greater all-electric range adds cost and entails compromises, so different all-electric ranges may suit different customers' needs. Plug-in hybrids provide the extended range and potential for refueling of conventional hybrids while enabling drivers to use battery electric power for at least a significant part of their typical daily driving. The average trip to or from work in the United States in 2009 was 11.8 miles (19.0 km), while the average distance commuted to work in England and Wales in 2011 was slightly lower at 9.3 miles (15 km). Since building a PHEV with a longer all-electric range adds weight and cost, and reduces cargo and/or passenger space, there is not a specific all-electric range that is optimal. The accompanying graph shows the observed all-electric range, in miles, for four popular U.S. market plug-in hybrids, as tested by Popular Mechanics magazine. A key design parameter of the Chevrolet Volt was a target of 40 miles (64 km) for the all-electric range, selected to keep the battery size small and lower costs, and mainly because research showed that 78% of daily commuters in the U.S. travel 40 mi (64 km) or less. This target range would allow most travel to be accomplished electrically driven and the assumption was made that charging will take place at home overnight. This requirement translated using a lithium-ion battery pack with an energy storage capacity of 16 kWh considering that the battery would be used until the state of charge (SOC) of the battery reached 30%. In October 2014 General Motors reported, based on data collected through its OnStar telematics system since Volt deliveries began, and with over 1 billion miles (1.6 billion km) traveled, that Volt owners drive about 62.5% of their trips in all-electric mode. In May 2016, Ford reported, based on data collected from more than 610 million miles (976 million km) logged by its electrified vehicles through its telematics system, that drivers of these vehicles run an average of 13,500 mi (21,700 km) annually on their vehicles, with about half of those miles operating in all-electric mode. A break down of these figures show an average daily commute of 42 mi (68 km) for Ford Energi plug-in hybrid drivers. Ford notes that with the enhanced electric range of the 2017 model year model, the average Fusion Energi commuter could go the entire day using no gasoline, if the car is fully charged both, before leaving for work and before leaving for home. According to Ford data, currently most customers are likely charging their vehicles only at home. The 2015 edition of the EPA's annual report "Light-Duty Automotive Technology, Carbon Dioxide Emissions, and Fuel Economy Trends" estimates the following utility factors for 2015 model year plug-in hybrids to represent the percentage of miles that will be driven using electricity by an average driver, whether in electric only or blended modes: 83% for the BMW i3 REx, 66% for the Chevrolet Volt, 45% for the Ford Energi models, 43% for the McLaren P1, 37% for the BMW i8, and 29% for the Toyota Prius PHV. A 2014 analysis conducted by the Idaho National Laboratory using a sample of 21,600 all-electric cars and plug-in hybrids, found that Volt owners traveled on average 9,112 miles in all-electric mode (e-miles) per year, while Leaf owners traveled 9,697 e-miles per year, despite the Volt's shorter all-electric range, about half of the Leaf's. Between January and August 2014, a period during which US sales of conventional hybrids slowed, US sales of plug-in hybrids grew from 28,241 to 40,748 compared to the same period in 2013. US sales of all-electric vehicles also grew during the same period: from 29,917 vehicles in the January to August 2013 period to 40,349 in January to August 2014. Plug-in hybrids have the potential to be even more efficient than conventional hybrids because a more limited use of the PHEV's internal combustion engine may allow the engine to be used at closer to its maximum efficiency. While a Prius is likely to convert fuel to motive energy on average at about 30% efficiency (well below the engine's 38% peak efficiency), the engine of a PHEV-70 would be likely to operate far more often near its peak efficiency because the batteries can serve the modest power needs at times when the combustion engine would be forced to run well below its peak efficiency. The actual efficiency achieved depends on losses from electricity generation, inversion, battery charging/discharging, the motor controller and motor itself, the way a vehicle is used (its duty cycle), and the opportunities to recharge by connecting to the electrical grid. Each kilowatt hour of battery capacity in use will displace up to 50 U.S. gallons (190 l; 42 imp gal) of petroleum fuels per year (gasoline or diesel fuels). Also, electricity is multi-sourced and, as a result, it gives the greatest degree of energy resilience. The actual fuel economy for PHEVs depends on their powertrain operating modes, their all-electric range, and the amount of driving between charges. If no gasoline is used the miles per gallon gasoline equivalent (MPG-e) depends only on the efficiency of the electric system. The first mass production PHEV available in the U.S. market, the 2011 Chevrolet Volt, with an EPA rated all-electric range of 35 miles (56 km), and an additional gasoline-only extended range of 344 miles (554 km) has an EPA combined city/highway fuel economy of 93 MPG-e in all-electric mode, and 37 mpg‑US (6.4 L/100 km; 44 mpg‑imp) in gasoline-only mode, for an overall combined gas-electric fuel economy rating of 60 mpg‑US (3.9 L/100 km; 72 mpg‑imp) equivalent (MPG-e). The EPA also included in the Volt's fuel economy label a table showing fuel economy and electricity consumed for five different scenarios: 30, 45, 60 and 75 miles (121 km) driven between a full charge, and a never charge scenario. According to this table the fuel economy goes up to 168 mpg‑US (1.40 L/100 km; 202 mpg‑imp) equivalent (MPG-e) with 45 miles (72 km) driven between full charges. For the more comprehensive fuel economy and environment label that will be mandatory in the U.S. beginning in model year 2013, the National Highway Traffic Safety Administration (NHTSA) and Environmental Protection Agency (EPA) issued two separate fuel economy labels for plug-in hybrids because of their design complexity, as PHEVS can operate in two or three operating modes: all-electric, blended, and gasoline-only. One label is for series hybrid or extended range electric vehicle (like the Chevy Volt), with all-electric and gasoline-only modes; and a second label for blended mode or series-parallel hybrid, that includes a combination of both gasoline and plug-in electric operation; and gasoline only, like a conventional hybrid vehicle. The Society of Automotive Engineers (SAE) developed their recommended practice in 1999 for testing and reporting the fuel economy of hybrid vehicles and included language to address PHEVs. An SAE committee is currently working to review procedures for testing and reporting the fuel economy of PHEVs. The Toronto Atmospheric Fund tested ten retrofitted plug-in hybrid vehicles that achieved an average of 5.8 litres per 100 kilometre or 40.6 miles per gallon over six months in 2008, which was considered below the technology's potential. In real world testing using normal drivers, some Prius PHEV conversions may not achieve much better fuel economy than HEVs. For example, a plug-in Prius fleet, each with a 30 miles (48 km) all-electric range, averaged only 51 mpg‑US (4.6 L/100 km; 61 mpg‑imp) in a 17,000-mile (27,000 km) test in Seattle, and similar results with the same kind of conversion battery models at Google's RechargeIT initiative. Moreover, the additional battery pack costs US$10,000–US$11,000. PHEVs save around 60% or 40% in energy costs, compared with conventional gasoline vehicles and HEVs, respectively. However, for drivers with significant daily vehicle miles traveled (DVMT), hybrid vehicles may be even a better choice than plug-in hybrids with a range of 40 mi (64 km), particularly when there is lack of public charging infrastructure. The incremental battery cost of large-battery plug-in hybrids is difficult to justify based on the incremental savings of PHEVs’ operating costs unless a subsidy is offered for large-battery PHEVs. When the price of gasoline increases from US$4 per gallon to US$5 per gallon, the number of drivers who benefit from a larger battery increases significantly. If the gas price is US$3, a plug-in hybrid with a range of 10 mi (16 km) is the least costly option even if the battery cost is $200/kWh. Although quick chargers can reduce charging time, they contribute little to energy cost savings for PHEVs, as opposed to Level-2 chargers. Disadvantages of plug-in hybrids include the additional cost, weight, and size of a larger battery pack. According to a 2010 study by the National Research Council, the cost of a lithium-ion battery pack is about US$1,700/kW·h of usable energy, and considering that a PHEV-10 requires about 2.0 kW·h and a PHEV-40 about 8 kW·h, the estimated manufacturer cost of the battery pack for a PHEV-10 is around US$3,000 and it goes up to US$14,000 for a PHEV-40. According to the same study, even though costs are expected to decline by 35% by 2020, market penetration is expected to be slow and therefore PHEVs are not expected to significantly impact oil consumption or carbon emissions before 2030, unless a fundamental breakthrough in battery technologies occurs. (2) Assuming 15,000 miles per year. According to the 2010 NRC study, although a mile driven on electricity is cheaper than one driven on gasoline, lifetime fuel savings are not enough to offset plug-ins' high upfront costs, and it will take decades before the break even point is achieved. Furthermore, hundreds of billions of dollars in government subsidies and incentives are likely to be required to achieve a rapid plug-in market penetration in the U.S.
A 2013 study by the American Council for an Energy-Efficient Economy reported that battery costs came down from US$1,300 per kilowatt hour in 2007 to US$500 per kilowatt hour in 2012. The U.S. Department of Energy has set cost targets for its sponsored battery research of US$300 per kilowatt hour in 2015 and US$125 per kilowatt hour by 2022. Cost reductions through advances in battery technology and higher production volumes will allow plug-in electric vehicles to be more competitive with conventional internal combustion engine vehicles. A study published in 2011 by the Belfer Center, Harvard University, found that the gasoline costs savings of plug-in electric cars over the vehicles’ lifetimes do not offset their higher purchase prices. This finding was estimated comparing their lifetime net present value at 2010 purchase and operating costs for the U.S. market, and assuming no government subidies. According to the study estimates, a PHEV-40 is US$5,377 more expensive than a conventional internal combustion engine, while a battery electric vehicle (BEV) is US$4,819 more expensive. The study also examined how this balance will change over the next 10 to 20 years, assuming that battery costs will decrease while gasoline prices increase. Under the future scenarios considered, the study found that BEVs will be significantly less expensive than conventional cars (US$1,155 to US$7,181 cheaper), while PHEVs, will be more expensive than BEVs in almost all comparison scenarios, and only less expensive than conventional cars in a scenario with very low battery costs and high gasoline prices. BEVs are simpler to build and do not use liquid fuel, while PHEVs have more complicated powertrains and still have gasoline-powered engines. Increased pollution is expected to occur in some areas with the adoption of PHEVs, but most areas will experience a decrease. A study by the ACEEE predicts that widespread PHEV use in heavily coal-dependent areas would result in an increase in local net sulfur dioxide and mercury emissions, given emissions levels from most coal plants currently supplying power to the grid. Although clean coal technologies could create power plants which supply grid power from coal without emitting significant amounts of such pollutants, the higher cost of the application of these technologies may increase the price of coal-generated electricity. The net effect on pollution is dependent on the fuel source of the electrical grid (fossil or renewable, for example) and the pollution profile of the power plants themselves. Identifying, regulating and upgrading single point pollution source such as a power plant—or replacing a plant altogether—may also be more practical. From a human health perspective, shifting pollution away from large urban areas may be considered a significant advantage. According to a 2009 study by The National Academy of Science, "Electric vehicles and grid-dependent (plug-in) hybrid vehicles showed somewhat higher nonclimate damages than many other technologies." Efficiency of plug-in hybrids is also impacted by the overall efficiency of electric power transmission. Transmission and distribution losses in the USA were estimated at 7.2% in 1995 and 6.5% in 2007. By life cycle analysis of air pollution emissions, natural gas vehicles are currently the lowest emitter. The additional electrical consumption to recharge the plug-in vehicles could push many households in areas that do not have off-peak tariffs into the higher priced tier and negate financial benefits. Customers under such tariffs could see significant savings by being careful about when the vehicle was charged, for example, by using a timer to restrict charging to off-peak hours. Thus, an accurate comparison of the benefit requires each household to evaluate its current electrical usage tier and tariffs weighed against the cost of gasoline and the actual observed operational cost of electric mode vehicle operation. The effect of PHEVs on greenhouse emissions is complex. Plug-in hybrid vehicles operating on all-electric mode do not emit harmful tailpipe pollutants from the onboard source of power. The clean air benefit is usually local because depending on the source of the electricity used to recharge the batteries, air pollutant emissions are shifted to the location of the generation plants. In the same way, PHEVs do not emit greenhouse gases from the onboard source of power, but from the point of view of a well-to-wheel assessment, the extent of the benefit also depends on the fuel and technology used for electricity generation. From the perspective of a full life cycle analysis, the electricity used to recharge the batteries must be generated from zero-emission sources such as renewable (e.g. wind power, solar energy or hydroelectricity) or nuclear power for PEVs to have almost none or zero well-to-wheel emissions. On the other hand, when PEVs are recharged from coal-fired plants, they usually produce slightly more greenhouse gas emissions than internal combustion engine vehicles. In the case of plug-in hybrid electric vehicle when operating in hybrid mode with assistance of the internal combustion engine, tailpipe and greenhouse emissions are lower in comparison to conventional cars because of their higher fuel economy. with PHEV model year 2015. (2) No direct or indirect land use changes included in the WTW analysis for bio-mass fuel feedstocks. The Argonne study found that PHEVs offered reductions in petroleum energy use as compared with regular hybrid electric vehicles. More petroleum energy savings and also more GHG emissions reductions were realized as the all-electric range increased, except when electricity used to recharged was dominated by coal or oil-fired power generation. As expected, electricity from renewable sources realized the largest reductions in petroleum energy use and GHG emissions for all PHEVs as the all-electric range increased. The study also concluded that plug-in vehicles that employ biomass-based fuels (biomass-E85 and -hydrogen) may not realize GHG emissions benefits over regular hybrids if power generation is dominated by fossil sources. A 2008 study by researchers at Oak Ridge National Laboratory analyzed oil use and greenhouse gas (GHG) emissions of plug-in hybrids relative to hybrid electric vehicles under several scenarios for years 2020 and 2030. The study considered the mix of power sources for 13 U.S. regions that would be used during recharging of vehicles, generally a combination of coal, natural gas and nuclear energy, and to a lesser extend renewable energy. A 2010 study conducted at Argonne National Laboratory reached similar findings, concluding that PHEVs will reduce oil consumption but could produce very different greenhouse gas emissions for each region depending on the energy mix used to generate the electricity to recharge the plug-in hybrids. 2 tailpipe emissions produced by these vehicles in real world city and highway operation based on the EPA 5-cycle label methodology, using a weighted 55% city/45% highway driving. The results are shown in the following table. 2 emissions associated with the production and distribution of electricity required to charge the PHEVs. Since electricity production in the United States varies significantly from region to region, the EPA considered three scenarios/ranges with the low end of the range corresponding to the California powerplant emissions factor, the middle of the range represented by the national average powerplant emissions factor, and the upper end of the range corresponding to the powerplant emissions factor for the Rockies. The EPA estimates that the electricity GHG emission factors for various regions of the country vary from 346 g CO2/kW-hr in California to 986 g CO2/kW-hr in the Rockies, with a national average of 648 g CO2/kW-hr. The following table shows the tailpipe emissions and the combined tailpipe and upstream emissions for each of the 10 MY 2014 PHEVs available in the U.S. market. 2 emissions per mile from driving PEVs are less than those from driving a hybrid car. However, in other regions, such as the Upper Midwest, charging during the recommended hours of midnight to 4 a.m. implies that PEVs generate more emissions per mile than the average car currently on the road. The results show a fundamental tension between electricity load management and environmental goals as the hours when electricity is the least expensive to produce tend to be the hours with the greatest emissions. This occurs because coal-fired units, which have higher emission rates, are most commonly used to meet base-level and off-peak electricity demand; while natural gas units, which have relatively low emissions rates, are often brought online to meet peak demand. This pattern of fuel shifting explains why emission rates tend to be higher at night and lower during periods of peak demand in the morning and evening. The Chevrolet Volt was the world's top selling plug-in hybrid until September 2018. Since 2008, plug-in hybrids have been commercially available from both specialty manufacturers and from main-stream producers of internal combustion engine vehicles. The F3DM, released in China in December 2008, was the first production plug-in hybrid sold in the world. The Chevrolet Volt, launched in the U.S. in December 2010, was the first mass-production plug-in hybrid by a major carmaker. There were 1.2 million plug-in hybrid cars on the world roads at the end of 2017. The stock of plug-in hybrids increased to 1.8 million in 2018, out of a global stock of about 5.1 million plug-in electric passenger cars. As of December 2017[update], the United States ranked as the world's largest plug-in hybrid car market with a stock of 360,510 units, followed by China with 276,580 vehicles, Japan with 100,860 units, the Netherlands with 98,220, and the UK with 88,660. Global sales of plug-in hybrids grew from over 300 units in 2010 to almost 9,000 in 2011, jumped to over 60,000 in 2012, and reached almost 222,000 in 2015. As of December 2015[update], the United States was the world's largest plug-in hybrid car market with a stock of 193,770 units. About 279,000 light-duty plug-in hybrids were sold in 2016, raising the global stock to almost 800,000 highway legal plug-in hybrid electric cars at the end of 2016. A total of 398,210 plug-in hybrid cars were sold in 2017, with China as the top selling country with 111,000 units, and the global stock of plug-in hybrids passed the one million unit milestone by the end of 2017. Evolution of the ratio between global sales of BEVs and PHEVs between 2011 and 2018. Global sales of plug-in electric vehicles have been shifting for several years towards fully electric battery cars. The global ratio between all-electrics (BEVs) and plug-in hybrids (PHEVs) went from 56:44 in 2012, to 60:40 in 2015, to 66:34 in 2017, and rose to 69:31 in 2018. The Netherlands, Sweden, the UK, and the United States have the largest shares of plug-in hybrid sales as percentage of total plug-in electric passenger vehicle sales. The Netherlands has the world's largest share of plug-in hybrids among its plug-in electric passenger car stock, with 86,162 plug-in hybrids registered at the end of October 2016, out of 99,945 plug-in electric cars and vans, representing 86.2% of the country's stock of light-duty plug-in electric vehicles. Sweden ranks next with 16,978 plug-in hybrid cars sold between 2011 and August 2016, representing 71.7% of total plug-in electric passenger car sales registrations. Plug-in hybrid registrations in the UK between up to August 2016 totaled 45,130 units representing 61.6% of total plug-in car registrations since 2011. In the United States, plug-in hybrids represent 47.2% of the 506,450 plug-in electric cars sold between 2008 and August 2016. In November 2013 the Netherlands became the first country where a plug-in hybrid topped the monthly ranking of new car sales. During November sales were led by the Mitsubishi Outlander P-HEV with 2,736 units, capturing a market share of 6.8% of new passenger cars sold that month. Again in December 2013 the Outlander P-HEV ranked as the top selling new car in the country with 4,976 units, representing a 12.6% market share of new car sales. These record sales allowed the Netherlands to become the second country, after Norway, where plug-in electric cars have topped the monthly ranking of new car sales. As of December 2013[update], the Netherlands was the country with highest plug-in hybrid market concentration, with 1.45 vehicles registered per 1,000 people. Note: (1) Market share of highway-capable plug-in hybrids as percentage of total new car sales in the country in 2013. The Mitsubishi Outlander P-HEV is the world's all-time best selling plug-in hybrid, with 200,000 units sold worldwide by April 2019. According to JATO Dynamics, the Mitsubishi Outlander P-HEV is the world's all-time best selling plug-in hybrid. Since inception, a total of 200,000 units have been sold worldwide by April 2019. Europe is the Outlander P-HEV leading market with 105,813 units sold, followed by Japan with 42,451 units, both through March 2018. European sales are led by the UK with 36,237 units, followed by the Netherlands with 25,489 units, and Norway with 14,196. Combined global sales of the Chevrolet Volt and its variants totaled about 186,000 units by the end of 2018, including about 10,000 Opel/Vauxhall Amperas sold in Europe through June 2016, and over 4,300 Buick Velite 5s sold only in China (rebadged second generation Volt) through December 2018. Volt sales are led by the United States with 152,144 units delivered through December 2018, followed by Canada with 17,311 units through November 2018. Until September 2018, the Chevrolet Volt was the world's top selling plug-in hybrid. Ranking third is the Toyota Prius Plug-in Hybrid (Toyota Prius Prime) with about 174,600 units sold worldwide of both generations through December 2018. The United States is the leading market with over 93,000 units delivered through December 2018. Japan ranks next with about 61,200 units through December 2018, followed by Europe with almost 14,800 units through June 2018.
and 4,317 units of the Buick Velite 5 sold only in China (rebadged second generation Volt). (2) Sales in China only. BYD Qin total does not include sales of the all-electric variant (Qin EV300). Several countries have established grants and tax credits for the purchase of new plug-in electric vehicles (PEVs) including plug-in hybrid electric vehicles, and usually the economic incentive depends on battery size. The U.S. offers a federal income tax credit up to US$7,500, and several states have additional incentives. The UK offers a Plug-in Car Grant up to a maximum of GB£5,000 (US$7,600). As of April 2011, 15 of the 27 European Union member states provide tax incentives for electrically chargeable vehicles, which includes all Western European countries plus the Czech Republic and Romania. Also 17 countries levy carbon dioxide related taxes on passenger cars as a disincentive. The incentives consist of tax reductions and exemptions, as well as of bonus payments for buyers of all-electric and plug-in hybrid vehicles, hybrid vehicles, and some alternative fuel vehicles. President Bush with A123Systems CEO on the White House South Lawn examining a Toyota Prius converted to plug-in hybrid with Hymotion technology. Incentives for the development of PHEVs are included in the Energy Independence and Security Act of 2007. The Energy Improvement and Extension Act of 2008, signed into law on October 3, 2008, grants a tax credits for the purchase of PHEVs. President Barack Obama's New Energy for America calls for deployment of 1 million plug-in hybrid vehicles by 2015, and on March 19, 2009, he announced programs directing $2.4 billion to electric vehicle development. The American Recovery and Reinvestment Act of 2009 modifies the tax credits, including a new one for plug-in electric drive conversion kits and for 2 or 3 wheel vehicles. The ultimate total included in the Act that is going to PHEVs is over $6 billion. In March 2009, as part of the American Recovery and Reinvestment Act, the US Department of Energy announced the release of two competitive solicitations for up to $2 billion in federal funding for competitively awarded cost-shared agreements for manufacturing of advanced batteries and related drive components as well as up to $400 million for transportation electrification demonstration and deployment projects. This announcement will also help meet the President Barack Obama's goal of putting one million plug-in hybrid vehicles on the road by 2015. President Barack Obama behind the wheel of a Chevy Volt during his tour of the General Motors Auto Plant in Hamtramck, Michigan. USDOE announced the selection of Navistar Corporation for a cost-shared award of up to $10 million to develop, test, and deploy plug-in hybrid electric (PHEV) school buses. 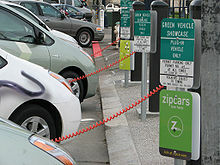 San Francisco Mayor Gavin Newsom, San Jose Mayor Chuck Reed and Oakland, California Mayor Ron Dellums announced a nine-step policy plan for transforming the Bay Area into the "Electric Vehicle (EV) Capital of the U.S." and of the world There are partnerships with Coulomb, Better Place and others are also advancing. The first charging stations went up in San Jose (more information in Plug-in hybrids in California). Electrification of transport (electromobility) is a priority in the European Union Research Programme. It also figures prominently in the European Economic Recovery Plan presented November 2008, in the frame of the Green Car Initiative. DG TREN will support a large European "electromobility" project on electric vehicles and related infrastructure with a total budget of around €50 million as part of the Green Car Initiative. Organizations that support plug-in hybrids include the World Wide Fund for Nature,", National Wildlife Federation, and CalCars. FPL and Duke Energy has said that by 2020 all new purchases of fleet vehicles will be plug-in hybrid or all-electric. ^ a b c "Mitsubishi Outlander PHEV Hits 200,000 Global Sales Milestones" (Press release). Tokyo: Mitsubishi Motors Corporation (MMC). 2019-04-11. Retrieved 2019-04-12. ^ a b c "BYD Auto To Begin Sales of F3DM Plug-in to Individuals". Green Car Congress. 2010-03-23. Retrieved 2010-03-27. ^ a b "BYD Auto to Offer F3DM Plug-in Hybrid to Chinese Individuals Starting Next Week". Edmunds.com. 2010-03-23. Archived from the original on 2010-03-30. Retrieved 2010-03-27. ^ a b c "First Chevy Volts Reach Customers, Will Out-Deliver Nissan in December". plugincars.com. 2010-12-16. Retrieved 2010-12-17. ^ a b Cobb, Jeff (2017-01-26). "Tesla Model S Is World's Best-Selling Plug-in Car For Second Year In A Row". HybridCars.com. Retrieved 2017-01-26. See also detailed 2016 sales and cumulative global sales in the two graphs. ^ a b c d e f Jose, Pontes (2019-01-31). "Global Top 20 - December 2018". EVSales.com. Retrieved 2019-02-02. "Global sales totaled 2,018,247 plug-in passenger cars in 2018, with a BEV:PHEV ratio of 69:31, and a market share of 2.1%. The world's top selling plug-in car was the Tesla Model 3, and Tesla was the top selling manufacturer of plug-in passenger cars in 2018, followed by BYD." ^ a b c d e f International Energy Agency (IEA), Clean Energy Ministerial, and Electric Vehicles Initiative (EVI) (May 2018). "Global EV Outlook 2017: 3 million and counting" (PDF). IEA Publications. Retrieved 2018-12-16. CS1 maint: Multiple names: authors list (link) See pp. 9–10, 19–23, 29–28, and Statistical annex, pp. 107–113. ^ a b Tilsley, Rachelle (2017-03-07). "What is the difference between AC and DC Charging?". Electric Vehicle Charging Network. Retrieved 2018-04-30. ^ "Making the Case for Grid-Connected Hybrids". EV World. 2001-09-23. Retrieved 2010-03-10. ^ "What's In A Name?". EV World. 2005-04-07. Retrieved 2010-03-10. ^ "The glossary". The Ergosphere. 2005-05-12. Retrieved 2010-03-10. ^ "Chevy Volt: The Future is Electrifying". Chevrolet. Retrieved 2010-03-05. ^ Fialka, John J. (2006-01-25). "Coalition Turns On to 'Plug-In Hybrids': Utilities, Localities, DaimlerChrysler Give Traction to Professor's Drive For High Mileage". The Wall Street Journal. Retrieved 2011-06-21. ^ "Plug-In Hybrids: State Of Play, History & Players". CalCars. Retrieved 2015-03-21. ^ Clayton, Mark (2008-07-19). "Can Plug-In Hybrids Ride to America's Rescue?". ABC News. Retrieved 2009-04-18. ^ "Hybrid Car Ready in 1969". Finkbuilt. 2007-01-09. Retrieved 2017-12-01. ^ Holinger, H. (2003) "Renault Electric Kangoo Can Do" Archived 2008-02-05 at the Wayback Machine EVWorld.com. Retrieved July 6, 2007. ^ Renault (March 10, 2003) "Kangoo reinvents the electric car" (PDF) press release. Retrieved January 8, 2009. ^ "How We Green-Tuned an '04 Prius into a PRIUS+ Plug-In Hybrid!". CalCars.com – The California Cars Initiative. Retrieved 2006-01-11. ^ Thomas, Ken (July 19, 2006). "Toyota charging ahead with plans for plug-in hybrid". Chicago Sun-Times/Associated Press. Archived from the original on November 2, 2007. ^ General Motors (November 29, 2006) "GM Announces Intention to Produce Plug-in Hybrid SUV" Archived 2011-06-10 at the Wayback Machine. Retrieved January 8, 2009. ^ Toyota Motor Corporation (July 25, 2007) "Japan Certifies Toyota Plug-in Hybrid for Public-road Tests" Archived 2007-09-28 at the Wayback Machine JCN Newswire. Retrieved July 25, 2007. ^ "Drive the Future with Fisker Automotive, A New Green American Premium Car Company" (PDF). 2007-09-05. ^ Motavalli, Jim (2011-12-02). "Unable to Raise Financing, Aptera Shuts Down". The New York Times. Retrieved 2011-12-03. ^ Edmunds (October 15, 2007) "Detroit Show Preview: BYD's New Plug-in Hybrid on Sale Next Year" Archived 2007-10-19 at the Wayback Machine Edmunds Inside Line. Retrieved October 26, 2007. ^ "Ford Delivers First Escape Plug-In Hybrid To Southern California Edison". Media.Ford.Com. Archived from the original on 2011-11-18. Retrieved 2010-11-27. ^ "Ford Motor Company – Press Release – Ford Motor Company Delivers Flexible Fuel, Plug-In Vehicle to Department of Energy". Ford.com. Archived from the original on 2009-06-22. Retrieved 2010-11-27. ^ a b "Ford Escape Plug-in Hybrid". hybridCars.com. Archived from the original on 2009-09-12. Retrieved 2010-04-21. ^ a b "Ford Unveils 'Intelligent' System for Plug-In Hybrids To Communicate with the Electric Grid". Ford.com. Archived from the original on 2010-07-21. Retrieved 2010-11-27. ^ "News Releases". TOYOTA. 2008-01-14. Archived from the original on 2008-01-17. Retrieved 2010-11-27. ^ Ohnsman, A. (August 28, 2008) "Toyota Plans Electric Car, Earlier Plug-In Prius Test" Bloomberg. Retrieved December 2008. ^ "Mazda plans Volt rival". Autocar. 2008-08-28. Retrieved 2010-11-27. ^ "Chrysler plans to sell electric car in 2010". New York Daily News. Associated Press. 2008-09-23. Retrieved 2015-03-15. ^ Spinelli, Mike (2008-09-23). "Chrysler Reveals Alternative-Energy Prototypes". Popular Science. Retrieved 2015-03-15. ^ "Nissan will sell electric car for just over $25K". Yahoo Finance. 2010-03-30. Archived from the original on 2010-04-05. Retrieved 2010-03-30. ^ John Voelcker (2015-01-29). "2016 BYD Tang: Plug-In Hybrid SUV Is First Of Four To Come". Green Car Reports. Retrieved 2015-02-17. BYD was the first company in the world to launch a production plug-in hybrid; its F3DM in 2008 was two years ahead of the 2011 Chevrolet Volt. ^ a b Chinese Car News (2013-12-19). "BYD Launches Qin Plugin Hybrid – 189,800RMB to 209,800RMB". China Car Times. Archived from the original on 2013-12-21. Retrieved 2013-12-19. ^ a b Crippen, A. (December 15, 2008) "Warren Buffett's Electric Car Hits the Chinese Market, But Rollout Delayed For U.S. & Europe" CNBC. Retrieved December 2008. ^ a b Balfour, F. (December 15, 2008) "China's First Plug-In Hybrid Car Rolls Out" Archived 2008-12-20 at the Wayback Machine Business Week. Retrieved December 2008. ^ a b "BYD F3DM Plug-in Hybrid Goes On Sale in China". Green Car Congress. 2008-12-15. Retrieved 2009-02-28. ^ English, Andrew (2010-01-05). "Toyota Plug-In Prius review". London: The Telegraph. Retrieved 2010-04-10. ^ a b "Lotus unveils range-extended electric city car concept in Paris". AutoblogGreen. 2010-10-02. ^ a b Gillies, Mark (2010-10-02). "Lotus City Car Concept – Auto Shows". Car and Driver. Archived from the original on 2010-10-05. Retrieved 2010-10-04. ^ Fehrenbacher, Katie (2011-07-26). "PHOTOS: Kleiner's Ray Lane receives his Fisker Karma". earth2tech. Retrieved 2011-07-26. ^ "Solid 13% Q2 sales increase for Toyota and Lexus vehicles in Europe" (Press release). Toyota Motor Europe. 2012-07-13. Archived from the original on 2015-10-16. Retrieved 2012-08-06. ^ Motavalli, Jim (2012-11-02). "Ford's Electric Cars: Starting Slow, and Waiting for the Market". PluginCars.com. Retrieved 2012-11-03. ^ "2013 (Q1) Sweden: Best-Selling Electric Cars and Plugin Hybrid Models". BestSellingCars.com. 2013-04-12. Retrieved 2013-04-15. ^ Brissette, Pete (2013-01-21). "2014 Honda Accord Plug-in Hybrid Now Available in Calif. And New York". HybridCars.com. Retrieved 2013-01-21. ^ Cole, Jay (2013-01-24). "Mitsubishi Outlander PHEV On Sale In Japan Today, Extended Promotional Video Released". Inside EVs. Retrieved 2013-01-28. ^ Sears, Jesse (2013-02-27). "2013 Ford Fusion Energi: Fuel Economy, Pricing and Release Date". Cars Direc. Archived from the original on 2013-03-05. Retrieved 2013-03-03. ^ Cole, Jay (2013-03-03). "February 2013 Plug-In Electric Vehicle Sales Report Card". Inside EVs. Archived from the original on 2013-03-04. Retrieved 2013-03-04. ^ Webb, Alysha (2013-05-02). "China's BYD Opens Electric Bus Production Plant in California". PluginCars.com. Retrieved 2013-05-11. ^ Nuñez, Beatriz. "BYD Presenta su Auto Híbrido Qin" [BYD Presents its Hybrid Car Qin] (in Spanish). Puro Motor. Archived from the original on 2013-12-16. Retrieved 2013-12-16. ^ EV World (2013-12-04). "BYD Announces Sales Launch of Qin Electric Hybrid in Latin America". EV World. Archived from the original on 2013-12-16. Retrieved 2013-12-16. ^ Voelcker, John (2013-12-09). "BYD Qin Plug-In Hybrid Now On Sale In Costa Rica". Green Car Reports. Retrieved 2013-12-16. ^ Joseph, Noah (2013-10-21). "McLaren P1 hits 62 mph in 2.8 seconds, 186 in 16.5". Autoblog.com. Retrieved 2013-10-21. ^ Cole, Jay (2014-01-03). "Cadillac ELR Arrives Early, Manages To Sell 6 Copies In December". InsideEvs.com. Retrieved 2014-01-03. ^ Loveday, Eric (2014-06-06). "World's First BMW i8 Owners Take Delivery In Germany". InsideEVs.com. Retrieved 2014-06-07. ^ Gnaticov, Cristian (2014-06-03). "First Volkswagen XL1 gets delivered to German customer". Inautonews. Archived from the original on 2014-06-07. Retrieved 2014-06-07. ^ Kane, Mark (2014-09-24). "Germany Plug-In Electric Vehicle Sales Report August 2014". InsideEVs.com. Retrieved 2014-09-29. ^ Loveday, Eric (2014-12-01). "BMW Commits To Offering Plug-In Hybrid Versions Of All Core-Brand Models". InsideEVs.com. Retrieved 2014-12-02. ^ Edelstein, Stephen (2015-03-06). "2016 BMW X5 xDrive 40e Plug-In Hybrid SUV To Debut In Shanghai Next Month". Green Car Reports. Retrieved 2015-03-21. ^ Thevenot, Brian & Hirsch, Jerry (2015-01-12). "Chevy Bolt electric car targets Tesla with low price, long range". The Los Angeles Times. Retrieved 2015-01-13. ^ Cobb, Jeff (2015-11-03). "2016 Volts Account For 1,324 Sales Out Of 2,035 October Deliveries". HybridCars.com. Retrieved 2015-11-03. ^ Millikin, Mike (2015-03-11). "Audi to have a plug-in hybrid in every model series; new BEV in 2018". Green Car Congress. Retrieved 2015-03-21. ^ Millikin, Mike (2015-03-18). "Mercedes-Benz to introduce 10 plug-in hybrids by 2017; GLE PHEV coming soon". Green Car Congress. Retrieved 2015-03-21. ^ a b Cobb, Jeff (2015-11-04). "GM Sells Its 100,000th Volt in October". HybridCars.com. Retrieved 2015-11-06. About 102,000 units of the Volt/Ampera family have been sold worldwide by the end of October 2015. ^ a b c International Energy Agency (IEA), Clean Energy Ministerial, and Electric Vehicles Initiative (EVI) (May 2016). "Global EV Outlook 2016: Beyond one million electric cars" (PDF). IEA Publications. Retrieved 2016-09-07. CS1 maint: Multiple names: authors list (link) See pp. 4–5, and 24–25 and Statistical annex, pp. 34–37. ^ Cobb, Jeff (2016-01-18). "Top Six Plug-in Vehicle Adopting Countries – 2015". HybridCars.com. Retrieved 2016-02-12. About 520,000 highway legal light-duty plug-in electric vehicles were sold worldwide in 2015, with cumulative global sales reaching 1,235,000. Plug-in hybrids represent about 40% of global plug-in electric vehicle sales. ^ "BMW at the 86th Geneva International Motor Show 2016" (Press release). Munich: BMW Group PressClub Global. 2016-02-12. Retrieved 2016-02-12. ^ Blanco, Sebastian (2016-03-22). "BMW 330e iPerformance brings new name to $44,695 PHEV". Autoblog.com. Retrieved 2016-03-22. ^ Jin-hai, Park (2016-01-14). "Hyundai launches Ioniq hybrid compact". Korea Times. Retrieved 2016-03-02. ^ Millikin, Mike (2016-03-24). "Hyundai unveils Ioniq HEV, PHEV and EV for US market at New York show". Green Car Congress. Retrieved 2016-03-24. ^ Cole, Jay (2016-02-21). "Hyundai IONIQ Electric Has A 28 kWh Battery, 105 Miles Real Range". InsideEVs.com. Retrieved 2016-03-02. ^ a b Kageyama, Yuri (2016-06-17). "Toyota gets bullish on plug-in hybrids with new Prius Prime". Japan Today. Retrieved 2016-06-17. ^ Cole, Jay (2016-12-02). "Several Plug-Ins Hit New 2016 Highs, As November EV Sales In US Rise Sharply". InsideEVs.com. Retrieved 2016-12-02. ^ Blanco, Sebastian (2016-03-23). "Toyota Prius Prime plugs in with 22 EV miles". Autoblog.com. Retrieved 2016-03-24. ^ LeSage, Jon (2016-10-05). "2017 Prius Prime Offers Industry's Best 'MPGe' and 25 Miles Electric Range". HybridCars.com. Retrieved 2016-10-15. ^ Voelcker, John (2016-10-10). "At 133 MPGe, Toyota Prius Prime wallops BMW i3 on energy efficiency". Green Car Reports. Retrieved 2016-10-15. ^ Cobb, Jeff (2016-05-03). "Mitsubishi Sells 100,000th Outlander PHEV". HybridCars.com. Retrieved 2016-05-03. As of March 2016[update], the world's top selling plug-in electric cars are the Nissan Leaf (over 218,000), Tesla Model S (about 120,000), Chevrolet Volt and Ampera variants (over 110,000), Mitsubishi Outlander PHEV (over 100,000), and Toyota Prius Plug-in Hybrid (75,000). All figures cumulative global sales since market launch. ^ Cobb, Jeff (2016-05-19). "China's BYD Qin PHEV Sells 50,000th Unit As Quickly As Did The Chevy Volt". HybridCars.com. Retrieved 2016-05-19. ^ Greimel, Hans (2016-06-25). "Nissan's to-do list: Range, autonomy". Automotive News. Retrieved 2016-06-27. ^ "2018 Honda Clarity Plug-in Hybrid Pricing to Start at $33,400" (Press release). US: Honda.com. 2017-11-16. Retrieved 2017-12-28. ^ "Plug-ins Progress". Green Car Congress. 2006-09-29. Retrieved 2017-12-30. ^ a b Gonder, J.; Markel, T. (2007-04-16). Energy Management Strategies for Plug-In Hybrid Electric Vehicles (PDF). SAE World Congress. Detroit. NREL/CP-540-40970. Archived from the original (PDF) on 2007-09-25. ^ "Shiau, C.-S., C. Samaras, R. Hauffe and J.J. Michalek (2009) "Impact of battery weight and charging patterns on the economic and environmental benefits of plug-in hybrid vehicles,"" (PDF). Retrieved 2010-11-27. ^ Romm, Joseph J.; Frank, Andrew A. (April 2006). "Hybrid Vehicles Gain Traction" (PDF). Scientific American. pp. 72–79. Retrieved 2017-12-30 – via The California Cars Initiative. ^ Bullis, Kevin (2006-08-03). "Are Lithium-Ion Electric Cars Safe?". Technology Review. Cambridge, Mass. : MIT. Retrieved 2017-12-30. ^ Fleissner, Chris (2006-08-14). "Johnson Controls partnership wins new contract". Wisconsin Technology Network. Retrieved 2017-12-30. ^ "Altair Nanotechnologies Details Long Life Features of its Nano Titanate Battery". Business Wire (Press release). Nano Science and Technology Institute. 2006-09-07. Archived from the original on 2007-09-27. ^ Voelcker, John (2007-01-02). "Lithium Batteries for Hybrid Cars". IEEE Spectrum. Retrieved 2017-12-30. ^ "How hybrids work". Canada: Toyota. 2016. Retrieved 2016-07-07. ^ Jansen, Matt. "Toyota laughs while Chevy Volt battery power is ripped in half". Archived 2008-06-17 at the Wayback Machine (Blog). tech.blorge, 2008-6-16. Retrieved on 2008-6-17. ^ Wald, M. L. (2008-01-13). "Closing the Power Gap Between a Hybrid's Supply and Demand". New York Times. Retrieved 2009-01-07. ^ Downing, Jim (2008-05-21). "Plug-in hybrids promise more power, greater efficiency". The Sacramento Bee. Archived from the original on 2008-05-28. ^ "Can Congress Hear From 6,692 Plug-In Supporters Today?". Calcars.org. Retrieved 2009-04-11. ^ "Calcars.org" (PDF). Retrieved 2010-11-27. ^ "Calcars.org". Calcars.org. Retrieved 2010-11-27. ^ California Cars Initiative (2007) "Where Plug-In Hybrid Conversions (mostly Priuses) Are". Retrieved July 8, 2007. ^ Stewart, James (2018-01-11). "Electric Vehicle Tax Credit Survives, but G.M. and Tesla Aren't Cheering". The New York Times. The New York Times Company. Retrieved 2018-04-30. ^ "Gauging interest for plug-in hybrid and electric vehicles in select markets: Alternative powertrain survey highlights". EY. Retrieved 13 October 2014. ^ "Summary of Travel Trends: 2009 National Household Travel Survey" (PDF). U.S. Department of Transportation – Federal Highway Administration. p. 13. Retrieved 12 October 2014. ^ "2011 Census Analysis, Distance Travelled to Work". Office for National Statistics (UK). 26 March 2014. Retrieved 12 October 2014. ^ Austin, Michael. "4 Top Plug-in Hybrids, Tested". Popular Mechanics. Retrieved 12 October 2014. ^ Edsall, Larry (2010). Endres, Chris (ed.). Chevrolet Volt: Charging into the Future. Foreword by Bob Lutz (Hardcover ed.). Minneapolis, Minnesota: Motorbooks. pp. 91–16. ISBN 978-0-7603-3893-3. ^ Loveday, Eric (2014-10-03). "Chevy Volt Owners Pass 1 Billion Total Miles". InsideEVs.com. Retrieved 2014-10-13. ^ Millikin, Mike (2016-05-27). "2017 Ford Fusion Energi PHEV boosts total range to 610 miles". Green Car Congress. Retrieved 2016-05-27. ^ U. S. Environmental Protection Agency (December 2015). "Light-Duty Automotive Technology, Carbon Dioxide Emissions, and Fuel Economy Trends: 1975 Through 2015" (PDF). EPA. Archived from the original (PDF) on 2016-06-02. Retrieved 2016-05-15. See Table 7.2 – MY 2015 Alternative Fuel Vehicle Powertrain and Range. ^ Nelson, Gabe (2015-03-28). "Calif. considers a plea for plug-in hybrids". Automotive News. Retrieved 2015-03-28. ^ "Electrified car sales stall as buyers back away from hybrids". Los Angeles Times. 4 September 2014. Retrieved 13 October 2014. ^ a b U. S. Environmental Protection Agency and U.S. Department of Energy (2011-05-27). "2011 Chevrolet Volt". Fueleconomy.gov. Retrieved 2011-05-31. ^ a b "Volt receives EPA ratings and label: 93 mpg-e all-electric, 37 mpg gas-only, 60 mpg-e combined". Green Car Congress. 2010-11-24. Retrieved 2011-05-31. ^ a b "EPA, DOT unveil the next generation of fuel economy labels". Green Car Congress. 2011-05-25. Retrieved 2011-05-31. ^ US Department of Energy (September 18, 2007) "Plug-In Hybrid Electric Vehicle Conversions" Alternative Fuels and Advanced Vehicles Data Center Retrieved November 8, 2007. ^ "RechargeIT.org". Google.org. Archived from the original on 2009-03-08. Retrieved 2009-04-11. ^ "Google.org". Google.org. Archived from the original on 2009-03-21. Retrieved 2009-04-11. ^ a b c National Research Council (2010). "Transitions to Alternative Transportation Technologies—Plug-in Hybrid Electric Vehicles". The National Academies Press. Retrieved 2010-03-03. ^ a b c Jad Mouawad & Kate Galbraith (2009-12-14). "Study Says Big Impact of the Plug-In Hybrid Will Be Decades Away". New York Times. Retrieved 2010-03-04. ^ a b c d National Research Council (2009-12-14). "Plug-In Hybrid Vehicle Costs Likely to Remain High, Benefits Modest for Decades". National Academy of Sciences. Retrieved 2010-03-04. ^ Tabuchi, Hiroko (2009-12-14). "Toyota to Sell Plug-In Hybrid in 2011". New York Times. Retrieved 2010-02-03. ^ Siddiq Khan & Martin Kushler (June 2013). "Plug-in Electric Vehicles: Challenges and Opportunities" (PDF). American Council for an Energy-Efficient Economy. Retrieved 2013-07-09. ACEEE Report Number T133. ^ a b Henry Lee & Grant Lovellette (July 2011). "Will Electric Cars Transform the U.S. Vehicle Market?". Belfer Center for Science and International Affairs, Kennedy School of Government. Retrieved 2011-08-07. ^ Henry Lee & Grant Lovellette (July 2011). "WillElectricCars Transform the U.S. Vehicle Market?" (PDF). Belfer Center for Science and International Affairs, Kennedy School of Government. Retrieved 2011-08-07. Discussion Paper #2011-08. ^ Knipping, E. and Duvall, M. (June 2007) "Environmental Assessment of Plug-In Hybrid Electric Vehicles Volume 2: United States Air Quality Analysis Based on AEO-2006 Assumptions for 2030" Electric Power Research Institute and Natural Resources Defense Council. Retrieved July 21, 2007. ^ "Hidden Costs of Energy: Unpriced Consequences of Energy Production and Use". National Academy of Science. 2009-10-19. ^ Technology Options 2003. Archived 2008-02-16 at the Wayback Machine (2003). US Climate Change Technology Program. ^ "Question: Where can I find data on electricity transmission and distribution losses?". Frequently Asked Questions – Electricity. U.S. Energy Information Administration. 2009-11-19. Retrieved 2010-03-28. ^ Bullis, K. (2006-12-21). "How Plug-in Hybrids Will Save the Grid". Technology Review. ^ a b c Sperling, Daniel and Deborah Gordon (2009). Two billion cars: driving toward sustainability. Oxford University Press, New York. pp. 22 to 26 and 114–139. ISBN 978-0-19-537664-7. ^ Searchinger, Timothy; et al. (2008-02-29). "Use of U.S. Croplands for Biofuels Increases Greenhouse Gases Through Emissions from Land-Use Change". Science. 319 (5867): 1238–1240. Bibcode:2008Sci...319.1238S. doi:10.1126/science.1151861. PMID 18258860. Retrieved 2008-05-09. Originally published online in Science Express on 2008-02-07. See Letters to Science by Wang and Haq. There are critics to these findings for assuming a worst-case scenario. ^ Moyer, Michael (July 2010). "The Dirty Truth about Plug-in Hybrids". Scientific American. Retrieved 2010-08-23. ^ "Different energy mixes will fuel plug-in hybrid cars". Argonne National Laboratory. 2010-08-17. Retrieved 2010-08-23. ^ Amgad Elgowainy; J. Han; L. Poch; M. Wang; A. Vyas; M. Mahalik & A. Rousseau (June 2010). "Well-to-Wheels Analysis of Energy Use and Greenhouse Gas Emissions of Plug-in Hybrid Electric Vehicles" (PDF). Argonne National Laboratory. Retrieved 2010-08-23. ^ a b c d e U. S. Environmental Protection Agency (October 2014). "Light-Duty Automotive Technology, Carbon Dioxide Emissions, and Fuel Economy Trends: 1975 Through 2014" (PDF). EPA. Retrieved 2014-10-12. See table 7.3 - Overall fuel economy (mpg-e), pp. 100. ^ Millikin, Mike (2014-10-11). "EPA Trends on EVs and PHEVs; beginning of a "measurable and meaningful impact" on new vehicle fuel economy and emissions". Green Car Congress. Retrieved 2014-10-11. ^ "The ZEV's invisible tailpipe – Are zero-emission vehicles cleaner than petrol cars? It all depends..." The Economist. 2014-11-24. Retrieved 2014-12-08. ^ Jose, Pontes (2017-01-31). "World Top 20 December 2016 (Updated)". EVSales.com. Retrieved 2017-02-05. Global light-duty plug-in vehicles sales totaled almost 775,000 units in 2016, of which, 36% were plug-in hybrids. ^ Staff (February 2017). "Global Plug-in Sales for 2016". EV-Volumes.com. Retrieved 2017-02-05. ^ Cobb, Jeff (2017-01-16). "The World Just Bought Its Two-Millionth Plug-in Car". HybridCars.com. Retrieved 2017-01-17. An estimated 2,032,000 highway-legal plug-in passenger cars and vans have been sold worldwide at the end of 2016. The top selling markets are China (645,708 new energy cars, including imports), Europe (638,000 plug-in cars and vans), and the United States (570,187 plug-in cars). The top European country markets are Norway (135,276), the Netherlands (113,636), France (108,065), and the UK (91,000). Total Chinese sales of domestically produced new energy vehicles, including buses and truck, totaled 951,447 vehicles. China was the top selling plug-in car market in 2016, and also has the world's largest stock of plug-in electric cars. ^ Cobb, Jeff (2016-11-17). "The Netherlands Becomes Sixth Country To Buy 100,000 Plug-in Vehicles". HybridCars.com. Retrieved 2016-11-18. ^ "2012 (Full Year) Sweden: Best-Selling Electric Cars & Plug-In Hybrid Models". BestSellingCars.com. 2013-04-02. Retrieved 2013-07-05. ^ "Nyregistreringar december 2013 prel" [New registrations in December 2013 prel] (in Swedish). Bil Sweden. 2014-01-02. Retrieved 2014-01-03. Download file "Nyregistreringar December 2013 prel.pdf" see table "NYREGISTRERADE SUPERMILJÖBILAR DECEMBER 2013" with summary of PEV sales by model for 2013 and 2012. ^ "Nyregistreringar december 2014 (prel)" [New registrations in December 2014 (preliminar)] (in Swedish). Bil Sweden. 2015-01-02. Retrieved 2015-01-04. Download file "Nyregistreringar december 2014 (prel)" see tables: "Nyregistrerade supermiljöbilar december 2014" with summary of plug-in passenger car registrations by model for 2013 (revised) and 2014, and table "Nyregistrerade eldrivna lätta lastbilar (högst 3,5 ton) per modell:" for plug-in utility vans registrations for the same two years. A total of 303,866 new passenger vehicles were registered in 2014, and a total of 4,656 super clean cars, resulting in a PEV market share of 1.53% of new car sales. ^ "Nyregistreringar december 2015 def" [New Registrations December 2015 (final)] (in Swedish). Bil Sweden. 2016-01-04. Retrieved 2016-04-15. Download the pdf file "Nyregistreringar december 2015 def" (PressRel1512_def.pdf) See table: Nyregistrerade miljöpersonbilar december 2015. ^ "Nyregistreringar augusti 2016 (II)" [New Registrations August 2016 (II)] (in Swedish). Bil Sweden. 2016-09-01. Retrieved 2016-09-18. Download the pdf file "Nyregistreringar augusti 2016 (II)" (PressRel1608II.pddf) See table: "Nyregistrerade miljöbilar per typ augusti 2016." A total of 6,129 plug-in hybrids and 1,627 all-electric cars were registered during the first eight months of 2016. ^ Society of Motor Manufacturers and Traders(SMMT) (2014-01-07). "December 2013 – EV and AFV registrations". SMT. Retrieved 2014-01-25. A total of 992 plug-in hybrids were registered during 2012 and 1,072 in 2013. ^ Cobb, Jeff (2016-09-01). "Americans Buy Their Half-Millionth Plug-in Car". HybridCars.com. Retrieved 2016-09-02. See details in captions and graphs. ^ a b Automotive Industry Data (AID) (2013-12-17). "Mitsubishi Outlander PHEV top seller". AID. Retrieved 2013-12-26. ^ Pontes, Jose (2014-01-04). "Netherlands December 2013". EV Sales. Retrieved 2014-01-05. ^ Gasnier, Mat (2013-12-04). "Netherlands November 2013: Mitsubishi Outlander shoots up to pole position!". Best Selling Cars Blog. Retrieved 2013-12-26. ^ Gasnier, Mat (2014-01-03). "Netherlands December 2013: Mitsubishi Outlander at 12.7% share, Volvo V40 and V60 on podium". Best Selling Cars Blog. Retrieved 2014-01-05. ^ Shahan, Zachary (2013-03-07). "Electric vehicle market share in 19 countries – Plug-in Hybrid EV Market Share in 2013". ABB Conversations. Retrieved 2014-04-12. ^ a b "New (MY19) Mitsubishi Outlander PHEV - Summer 2018" (PDF) (Press release). Mitsubishi Motors. 2018. Retrieved 2018-10-31. See tables in pp. 3-4. ^ a b Cobb, Jeff (2017-01-09). "Nissan's Quarter-Millionth Leaf Means It's The Best-Selling Plug-in Car In History". HybridCars.com. Retrieved 2017-01-10. As of December 2016[update], the Nissan Leaf is the world's best-selling plug-in car in history with more than 250,000 units delivered, followed by the Tesla Model S with over 158,000 sales, and the Volt/Ampera family of vehicles with 134,500 vehicles sold. ^ a b c "Chevrolet Volt Sales Numbers". GM Authority. January 2019. Retrieved 2019-02-01. Canadian sales totaled 4,313 units in 2017 and 4,114 in 2018 through November. ^ a b Cain, Timothy (October 2018). "Chevrolet Volt Sales Figures". Good Car Bad Car. Retrieved 2018-12-01. ^ a b c d "Buick Velite 5 ( Chinese Car Sales Data)". Car Sales Base. Retrieved 2019-02-01. Buick Velite 5 sales in China totaled 1,629 units in 2017 and 2,688 in 2018. ^ Cobb, Jeff (2016-12-12). "Chevy Volt and Nissan Leaf Celebrate Their Sixth-Year Anniversary". HybridCars.com. Retrieved 2016-12-14. Global cumulative sales of plug-in electric vehicles totaled about 1.9 million units through November 2016. The Nissan Leaf is the world's leading plug-in car with more than 240,000 units delivered. As of November 2016[update], the Tesla Model S ranks next with over 151,000, followed by the Vollt/Ampera family of vehicles with 130,500 vehicles sold including over 10,000 Opel/Vauxhall Amperas sold in Europe, the Mitsubishi Outlander PHEV with about 116,500 units, and the Toyota Prius PHV with about 76,200. ^ a b c d "Toyota sells 1.52 million electrified vehicles in 2017, three years ahead of 2020 target" (Press release). Toyota City, Japan: Toyota. 2018-02-02. Retrieved 2018-10-29. ^ Pontes, Jose (2019-01-29). "Japan December 2018". EVSales.com. Retrieved 2019-02-01. A total of 52,013 plug-in cars were sold in Japan in 2018, with a market share of 1.0%. The Nissan Leaf was the top selling plug-in model with 25,722 units, followed by the Prius PHEV with 12,401 units. ^ "46% of Toyota Motor Europe (TME) sales in H1 are self-charging hybrid electric vehicles" (Press release). Brussels: Toyota Europe Newsroom. 2018-07-11. Retrieved 2019-02-01. Toyota sold 1,693 Prius PHEV during the first half of 2018. ^ "Mitsubishi Motors continues recovery with 18% sales growth in calendar year 2018" (Press release). Tokyo: Mitsubishi Motors. 2019-01-30. Retrieved 2019-02-03. Global sales of the Mitsubishi Outlander PHEV totaled 42,337 units in 2018, up from 25,767 in 2017. ^ Pontes, Jose (2018-04-30). "Global Top 10 March 2018". EVSales.com. Retrieved 2018-10-31. Global sales of the Mitsubishi Outlander PHEV totaled 8,970 units during the first three months of 2018. ^ a b Kane, Mark (2019-01-14). "BYD Sold Record 37,000 Electric Cars In December 2018". InsideEVs.com. Retrieved 2019-01-14. BYD Auto sold in China 227,152 plug-in cars, up 109% from 2017. During 2018 BYD Qin sales totaled 47,425 units and BYD Tang sales totaled 37,146 units. ^ a b Kane, Mark (2018-01-26). "BYD #1 In World For Plug-In Electric Car Sales In 2017, Beats Tesla Again". InsideEVs.com. Retrieved 2018-10-31. During 2017, BYD Qin sales totaled 20,738 units and BYD Tang totaled 14,592 units. ^ Staff (2017-01-19). "Best-selling China-made EVs in 2016". China Auto Web. Retrieved 2017-01-25. Three BYD Auto models topped the Chinese ranking of best-selling new energy passenger cars in 2016. The BYD Tang SUV was the top selling plug-in electric car in China in 2016 with 31,405 units sold, followed by the BYD Qin with 21,868 units sold, and ranking third overall in 2016 was the BYD e6 with 20,605 units. ^ Staff (2016-02-13). "Best-selling China-made SUVs in 2015". China Auto Web. Retrieved 2016-01-17. A total of 18,375 Tangs were sold in China in 2015. ^ Staff (2016-02-11). "Opel bringt 2017 neues Elektroauto" [Opel brings new electric car in 2017]. Autohaus.de (in German). Retrieved 2019-02-01. About 10,000 Opel Amperas were sold in Europe by the end of 2015. ^ Mike Costello (2015-04-25). "The Holden Volt is dead". Car Advice. Retrieved 2019-02-01. ^ Hudson, Paul (2010-02-28). "£5,000 grant to buy plug-in electric cars". London: The Daily Telegraph. Retrieved 2010-04-23. ^ "Ultra-low carbon cars: Next steps on delivering the £250 million consumer incentive programme for electric and plug-in hybrid cars" (PDF). Department for Transport. July 2009. Retrieved 2010-04-23. ^ Hockenos, Paul (2011-07-29). "Europe's Incentive Plans for Spurring E.V. Sales". The New York Times. Retrieved 2011-07-31. ^ "Overview of Purchase and Tax Incentives for Electric Vehicles in the EU" (PDF). European Automobile Manufacturers Association. 2011-03-14. Archived from the original (PDF) on 2011-09-27. Retrieved 2011-07-31. ^ Evarts, E. (January 11, 2008) "Charge! Fuel economy law promotes plug-in hybrids," Archived 2008-01-13 at the Wayback Machine Consumer Reports Cars Blog. Retrieved January 15, 2008. ^ "Barack Obama and Joe Biden: The Change We Need | New Energy for America". My.barackobama.com. 2008-06-22. Retrieved 2009-04-11. ^ "President Obama Announces $2.4 Billion for Electric Vehicles". Apps1.eere.energy.gov. Archived from the original on 2011-07-16. Retrieved 2010-11-27. ^ "Loc.gov" (PDF). Retrieved 2010-11-27. ^ "Conference Results: Stunning Expansion of Plug-In Tax Credits". Calcars.org. 2009-02-12. Retrieved 2009-04-11. ^ "Do You Realize Plug-Ins Get $5–$10+ Billion in Stimulus Package?". Calcars.org. 2008-12-31. Retrieved 2009-04-11. ^ "EERE News: President Obama Announces $2.4 Billion for Electric Vehicles". Apps1.eere.energy.gov. 2009-03-19. Archived from the original on 2009-03-20. Retrieved 2009-04-11. ^ "Energy.gov". Apps1.eere.energy.gov. Archived from the original on 2010-05-27. Retrieved 2010-11-27. ^ a b "Mayors Aim to Make San Francisco Bay Area the Electric Vehicle Capital of the U.S." San Francisco Office of the Mayor. 2008-11-20. Archived from the original on 2009-10-03. ^ a b "SF Plug-In Vehicle Bonanza:Watch Video, Read About It". Calcars.org. Retrieved 2009-04-11. ^ "Climate Change – What are we doing about it in Washington State? – Electrify Transportation". Ecy.wa.gov. Archived from the original on 2011-06-12. Retrieved 2010-11-27. ^ "Seattle Mayor Introduces City's First PHEV". Green Car Congress. 2008-05-31. Retrieved 2010-11-27. ^ "Ec.europa.eu". Ec.europa.eu. Archived from the original on 2011-03-19. Retrieved 2010-11-27. ^ "Cars should plug-in to a new future". World Wildlife Foundation. 2008-04-02. ^ "Obama's Briefing; Sandalow To DOE; Automaker News; Nat'l Wildlife Federation Embraces PHEVs". Calcars.org. 2009-03-27. Retrieved 2009-04-11. ^ "Plug-In Endorsements: Inauguration + Senate '09 Freedom Act". Calcars.org. 2009-01-16. Retrieved 2009-04-11. ^ "Senate Alert/GM Reaches Out/EDTA/Tracking Carmakers/TED/Wellinghoff". Calcars.org. Retrieved 2009-04-11. ^ "Plug-in Hybrid Electric School Bus". Advancedenergy.org. Archived from the original on 2010-07-11. Retrieved 2010-11-27. ^ "Businesswire.com". Businesswire.com. 2009-09-24. Retrieved 2010-11-27. Wikimedia Commons has media related to Plug-in electric hybrid-powered vehicles. Plug-In Hybrid Electric Vehicle Value Proposition Study Final Report, July 2010. "Plugging into the Grid" by Joseph J. Romm and Peter Fox-Penner in the Progressive Policy Institute's March 2007 newsletter, explaining how PHEVs can help "break America's oil addiction and slow global warming"
Plug-In.com – Plug-in and Hybrid News, Comparisons, Discussion. List of Plug-in Vehicles (Plug In America). Argonne National Laboratory, Cradle-to-Grave Lifecycle Analysis of U.S. Light-Duty Vehicle-Fuel Pathways: A Greenhouse Gas Emissions and Economic Assessment of Current (2015) and Future (2025–2030) Technologies (includes estimated cost of avoided GHG emissions from BEVs and PHEVs), June 2016. Boschert, Sherry (2007). Plug-in Hybrids: The Cars that will Recharge America (1st ed.). New Society Publishers. ISBN 0-86571-571-8. Archived from the original on 2008-12-31. Nevres, Cefo (2009). Two Cents per Mile: Will President Obama Make it Happen With the Stroke of a Pen?. Nevlin LLC. ISBN 978-0-615-29391-2. Michalek, Jeremy (February 2015). "CMU team finds regional temperature differences have significant impact on EV efficiency, range and emissions". Green Car Congress. U.S. Environmental Protection Agency, Application of Life-Cycle Assessment to Nanoscale Technology: Lithium-ion Batteries for Electric Vehicles, April 2013.